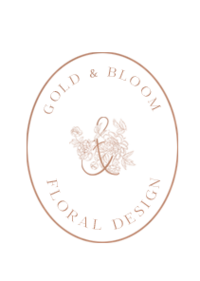 In January, I was able to cross off a major Gold & Bloom bucket list item–attend a floral workshop! Since the beginning of my floral design journey, I knew it would be important for me to challenge and push myself to learn more about design and floral artistry as a whole. Until this workshop, I was completely self taught and learned by trial and error (and a few online videos). When we found out we were expecting our first child, my eagerness to attend a workshop skyrocketed. I knew if I didn’t hurry up and find a good workshop soon, that it could be years before I allow myself to take such a big trip. I have followed Katie of Ponderosa and Thyme on Instagram for years now, and immediately reached out to her to see if she had any winter availability…and she did! So when I was thirty weeks pregnant, Lamar and I packed up and flew to Oregon for the most dreamy, challenging, joy-filled trip. Katie taught me so much about floral design, pushing myself out of my comfort zone, and finding my joy and peace as a designer. It was more than a floral design workshop. I felt so close to God during my time there, which helped me realize for sure that this flowery path is the right one. One moment from the workshop that stands out to me, that I keep reminding myself of is when Katie said, “You are a visual artist. Say it.” and she made me say it out loud. Saying those words was actually hard for me, as I had never really thought of myself as an artist. She encouraged me, though, that it was the truth. So much growth happened during this workshop, and I’m excited to share the beautiful photos from our final day of the workshop. 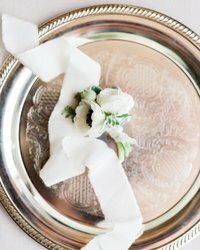 We put together a styled shoot and we designed a few bouquets and a gorgeous floating installation. The beauty of it all was unreal. 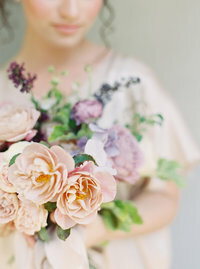 Dresses: Claire Pettibone, Anna Campbell Bridal, The English Dept. My 1:1 Ponderosa workshop experience was such a dream, and Oregon is such a beautiful part of the country! It was our first time out there, so on our last day there Lamar and I rented a car and drove up part of the coast. We ate delicious food along the way and stopped at so many beautiful beaches. We hope to go back again–next time with baby Cooper! View the full album of photos from this workshop in the gallery.